The Graduate Aptitude Test of Engineering or GATE is an entrance test to postgraduate admission in several premium engineering colleges and institutes in India. Passing in GATE is also considered as a primary criterion in several PSU jobs like NTPC, ONGC, BHEL, HP, etc. A large number of candidates appear in the GATE examination for pursuing higher studies or getting their dream jobs. This post will teach you a few GATE preparation tips for Mechanical Engineering to crack this prestigious exam. Engineering Mathematics: This consists of calculus, differential calculus, complex variables, and numerical methods. Applied Mechanics and Design: This consists of engineering mechanics, mechanics of materials, the theory of machines and vibrations. Fluid Mechanics and Thermal Sciences: This consists of fluid mechanics, heat transfer, thermodynamics and applications of fluid mechanics. Students who are willing to appear in the GATE need to look at the syllabi of all these subjects and their subtopics for a thorough preparation. Two types of questions are given in the examination: Multiple Choice Questions (MCQs) and Numerical Answer Questions. Mechanical Engineering students must prepare on the basis of syllabus and need to be well-versed in basic physics concepts, applications of related formulas, and complicated mathematical calculations related to advanced mathematics. If required, the student should revise the Newtonian Mechanics covered in the lower classes to ensure that the preparation on all the related topics is perfect. They must have a clear idea and experience on how to use the concepts in the real-world situations. It should be kept in mind that the PSUs call those candidates who have obtained a fair amount of score in all these sections. So, it is needed to follow the best GATE exam preparation tips for mechanical engineering to obtain high scores in all these subjects. A full-proof strategy is required for a thorough preparation prior to the examination. Only the knowledge on the subject matters won’t be sufficient to crack GATE Mechanical Engineering. It’s also important to acquire professional knowledge and be confident enough that they can tackle any problem on all these subjects. Practicing mock tests is helpful to gain more confidence and expertise. Though sounds casual, it is frequently found that the GATE applicants appear in the examination without knowing the system and pattern of the examination completely. GATE examination is a single paper examination that is conducted online. It is a three hours’ examination where the candidates have to answer 65 questions carrying 100 marks. The question paper consists of MCQs and Numerical Answer Type questions. As GATE Mechanical Engineering is conducted on the basis of four subjects or sections as discussed previously, it is necessary for a GATE aspirant to know the syllabus in detail. Though the weightage on each subject is not precise, a student needs to assess the weightage from the previous years’ question papers and successful candidates. Knowing the probable weightage on each section will help the candidate appearing in the examination to prepare accordingly. One needs to collect the best study materials and books. 1-2 books on all subjects are just sufficient but those should be selected appropriately. Textbooks are imperative than the supportive books. Scores of online materials are available these days, not all are appropriate or effective. Daily routine is mandatory, till the examination day, a student needs to take preparation as per the schedule without fail. If GATE is the target, then preparation should be started as early as possible. Students who can start studying from 3rd year of their college life can enhance the chance of success in the examination. Success in GATE means getting an appointment in the best PSUs or getting a scope to pursue higher studies in the best college or institute. 8-12 months’ preparation is required for the ultimate success in the GATE. However, one must have professional knowledge on the subjects as well as an accurate knowledge on how the systems, methodologies, and formulations work in the real-life situations. Questions are given on practical problems related to the subjects. So the students need preparation for solving these types of problems. All the chapters in the syllabus are to be covered thoroughly. In this matter, pure text books should be followed. Weakness in any topic reduces the chance of success. So, all measures are to be taken to become stronger on those weaker areas. Learning out of syllabus topics is useless for the GATE aspirants. That spoils the time. So, one needs to stick to the syllabus. Previous years’ question papers should be solved repetitively. It helps a candidate understand the question pattern and weightage on each section. Confusion in mathematical applications is not welcomed. A candidate should be well aware about his or her weak areas and take necessary steps to make those areas stronger. Serious GATE aspirants make it a habit of completing the upcoming syllabus of their engineering course before the start of the semester. It helps them to prepare for the GATE with sufficient time throughout the semester. Time management is a must. For this, a clear preparation strategy is required. Consistency in preparation is also necessary. Mere planning will not work unless the student is serious enough to take action according to that plan. If required, one must look for a professional guidance. Discussing with fellow GATE aspirants on the complicated questions and how they are preparing is helpful. In the examination, all questions should be attempted in properly. One month prior to the examination, taking time bound mock test is very effective. In the examination, the easy questions should be answered first and solve quickly. Thereafter, time should be kept for the complicated questions. GATE applicants often ask how to score in GATE mechanical. The above-mentioned tips will help them to obtain a high score in the examination and enjoy better career prospect in the future. Every year, lakhs of students appear in GATE mechanical engineering and try their best to obtain cut off marks required for the admission to their targeted institutes or colleges. As such, a GATE mechanical engineering candidate should have a clear objective and preparation strategy for achieving the desired result. 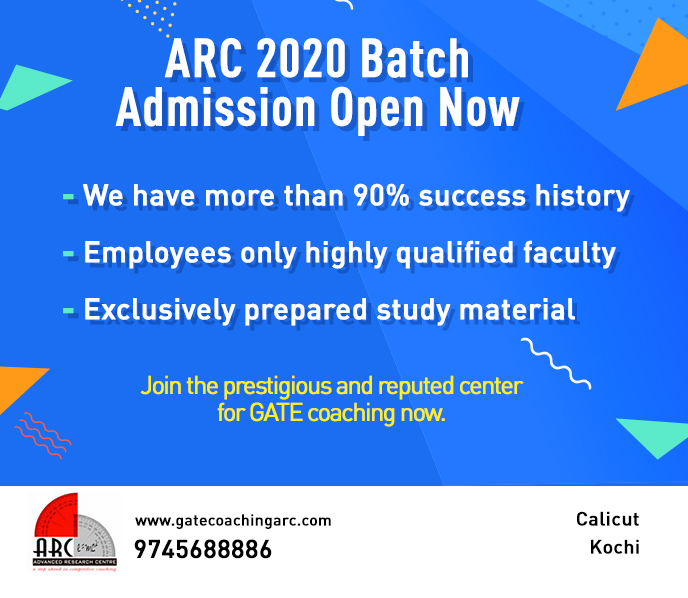 ARC foundation is one of the best GATE Coaching center in Kerala. 1000’s of students who enroll in our coaching center have successfully cracked the GATE and are into some of the best colleges in our country.